There are 32 mindfulness exercises you can use to be mindful all day long. As a meditation teacher, people often ask me for daily mindful habits. Little ways to stay mindful all day long, so they don’t get lost in thoughts, feelings, and emotions, so they are always conscious. 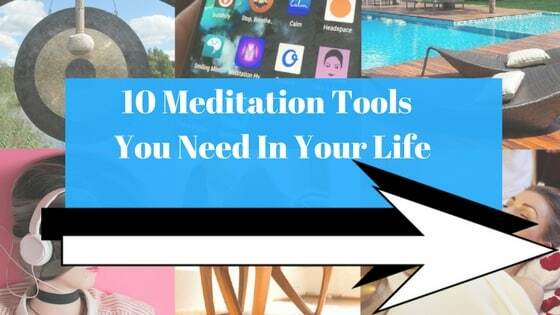 The good news is this: There are hundreds of different mindfulness exercises and activities you can use. However, some of them are a lot more effective than others. That’s why in the list below I have only included the most effective mindfulness exercises. Of course, before you do those exercises, you should start by learning how to do mindfulness meditation properly. Read that link and learn about what mindfulness really is. 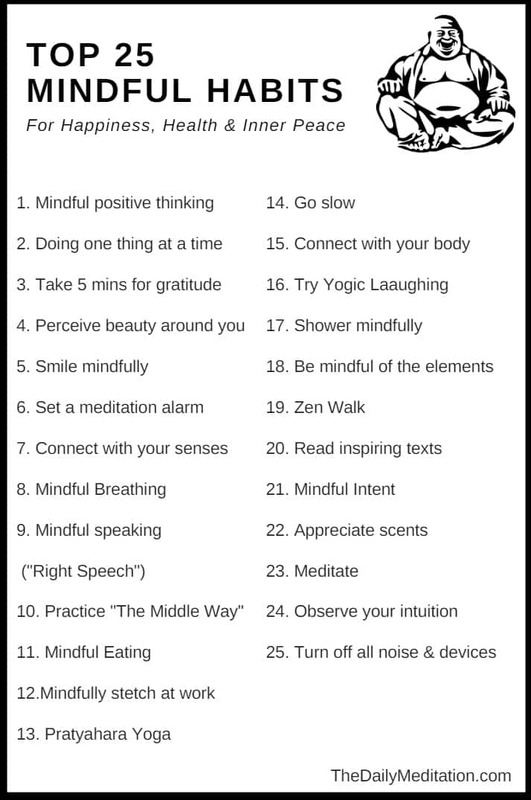 Then use the exercises below to help yourself to stay mindful all day long. You can also use mindfulness apps like Calm / Headspace. If you want to boost your consciousness and start being more mindful, you should begin with your habits. Why? Because our habits are our routines. They are the things we do day-in and day-out. They are the actions that we repeat every day. And because of that, our habits are the backbone of the success mindset. Habits are incredibly important because we do them unconsciously, without thought. Some people have bad habits (example: smoking), which they do regularly without thought (mindlessly). As a result they become seriously sick because of bad habits. Good habits help us to live a healthy life every day, automatically, without even thinking about it. Habits are activated based on different triggers. Thousands of THE DAILY MEDITATION’s readers have started getting in the mindful habit by using my meditation tracking strategy. The mindfulness habit helps us to stay meditative when we are not meditating. When you’re being mindful, you simply observe the world, or your thoughts and feelings, without judging them as positive or negative, good or bad. This relaxed, accepting state of mind is incredibly healthy. So the main benefit of mindful habits is that they keep the mind in a healthy state. Mindfulness exercises and activities are a powerful way to strengthen the mind. There are 25 really easy mindful habits that will help you to live in the moment from morning to night. Why not give each of them a try. They will empower you to start living in the moment. Make (healthy) positive thinking a habit. Healthy positive thinking is not the same as “positive thinking”. Healthy positive thinking means thinking in a healthy way. Mindfulness means focusing on what you are doing. No matter what you are doing, you can do it mindfullly. Whatever you do, do it mindfully. A moment lived mindlessly is a moment lost forever. Recognise that this moment right now is infinite. This moment stretches across space and time. This moment connects us all together. We might be in different countries. We might be different people. But we’re all now. This moment is what holds you and me and the whole world together. And that’s pretty awesome when you think about it. Show appreciation for the individual moments of your life. There is beauty in everything. Every person. Every flower. Every teardrop. Every smile. Beauty permeates the very fabric of existence. Perceive the beauty. And love it. The science of Positive Psychology has proven that people who are able to see and appreciate beauty are happier and healthier than others . Just by appreciating the beauty in lie you will be happier and healthier. There are so many benefits of smiling. You see that person outside the window? Go on. Give them a great big smile. Smile mindfully. Feel the energy of your smile. Make this one a habit because it;s one of the best exercises to be mindful all day long. One of the most important daily Buddhist habits is just to be mindful. Exercises can help with this. But the easiest way to remind yourself to be mindful is to just go ahead and set an alarm. Set an alarm to go off every hour. If you have an Alexa / Google Home or similar device you can actually set it up so the voice tells you to “be mindful” at the beginning of every hour. Or you could use a more traditional alarm, like a Tibetan Singing Bowl or bird call. When the alarm goes off, take sixty seconds—just sixty seconds—to be mindful. That’s all it takes, sixty seconds. We come to life when we live through the senses. Your senses are always working. You’re always seeing things, hearing things, smelling things… be aware of those senses. You can use exercises to be mindful of your senses. Ask what you’re perceiving with each of your senses. Be more aware of the sensory world. The more you’re aware of your senses, the more you live. This is one of the most important mindful habits of all. We have five senses for a reason. The more we use them the better we will be. Your breath is a sacred and beautiful thing. Breath connects us to the outside world. We take in life through air and breathe it deep into our bodies. It sustains us. It keeps us alive. When you feel stressed, take five deep breaths and really focus on the air coming in and going out of your body. One of the main Buddhist wisdoms is right speech. This is the idea that all speech should be kind, compassionate, and loving. Enlightened people have mastered the art of right speech. We always speak consciously and with love and kindness. For newcomers it can be a challenge. Try practicing some exercises to be mindful of your speech. The next time you say something to someone (anyone) really focus on the sound of your words. Your words are infinite. You could say anything. You could say something so profound it changes someone’s life. Focus on your words and really say something that truly matters. This is one of the absolute best mindful habits because it creates happiness for us and for the people around us. Did you know Buddhists are more satisfied in life than the average person? One reason is because of the Buddhist habit of majjhima patipada, which is the “middle way”. The middle way is about moderation. It is about not indulging and not starving yourself. In other words, living in moderation. This Buddhist habit teaches us to enjoy life but without indulging, and to control our senses but without self-mortification. Food nourishes our body and mind. It is enlightened to be mindful while eating. And it is one off the most important Buddhist habits. The next time you go to eat something, choose the food mindfully. Really pay attention to what you’re eating. Be aware of what it is, where it comes from, what it tastes like… everything. This is one mindful habit that will make you a lot more healthy. One of the absolute best habits for healthy is to do some basic yoga poses at your office chair. The majority of people live too sedentary lifestyles. Scientific research shows that sedentary lifestyle contribute to premature death. To counteract this, start doing my favorite yoga habit: doing yoga in your office chair. Try the Office Yoga App [Play Store]. It shows how to do asanas while at the office. Pratyhara is a yoga practice for the mind. In pratyhara yoga we reduce negative influences (such as negative people), and increase positive influences. We can turn this into a yoga-habit. To do so, be mindful of the affect different people, objects, and sources of information (like TV, Facebook etc). When you come across negative influences, find ways to reduce them. This could be as simple as turning off the TV, or a complex as ending an abusive relationship. Life is a musical score in which beats are made of moments. Go slowly enough to enjoy those moments. Don’t rush over them. This is your life. Love it. Live it. Enjoy it. Take the time to slow down each day. One way to make this a habit is to choose specific times when you will slow down (such as at lunch break). Ultimately, yoga is about the mind-body connection. The best yoga habit is mindfully observing your body at various times of the day. You will notice many things when you do this. You may find times of bad posture, which could be causing spinal injury. You could find that you have a bad body language gesture that is giving people a negative impression of you (for instance, you have a habit of scrunching your nose, which is an unconscious sign of disgust). Negative body language like this can have a massive effect on your social life. By being mindful of your body you can find bad habits that you can change. This can boost your health, your image, and yes, your yoga practice. There is a kind of alternative yoga called Laughter Yoga. In laughter yoga, we intentionally laugh and let out stress. This is cathartic and good for the soul. The next time you laugh, truly go with it, and mindfully observe the feelings of laughing. Eyesight is the most powerful sense of all. When we close off our sight, we become more mindful of our other senses (and we also improve our cognitive functioning because we are less distracted by external stimuli). To take advantage of this, try mindfully showering with your eyes closed. This is one of the most relaxing mindfulness exercises you can do. And it is a good exercise for being mindful in the morning (presuming you shower in the morning, of course). Be mindful of the sounds, feelings, and scents in the shower. Express gratitude for the water. There are over a hundred benefits of meditation. And the majority of those benefits can be gleaned from as little as 20 minutes a day. But how do you make meditation a habit so that you actually do it every day? From years of personal experience my advice is to meditate in the morning. Our willpower is highest in the morning. Plus, in the morning we have less on our minds and are less likely to be distracted because we have yet to start doing anything. A particularly good idea is to change your alarm to a Zen sound (for instance, use an alarm that has chanting sounds). Then you can wake up to a relaxing sound and immediately start meditating. Meditation is one of the best ways to start your day positively. The elements are sources of great power. By being mindful of the elements we can connect with nature and with the divine. Water is one of the most divine things in the world. It’s pure, and it’s perhaps the number one representation of the power of nature. The next time you’re around water, just take a moment to meditate on it. Focus on the flow of the water. Feel the energy and notice how free water is. Ask that sense of freedom to enter your own life. Rain is the healing of the land, the purifying of the world. Rain connects the sky to the earth. It’s symbolic of the perpetual cycle of life. Whenever there’s rain, meditate on it. Stand out in the rain and feel the cool droplets cleansing your spirit. Thunder is a symbol of power. Close your eyes and listen to that roll and clap of thunder in the skies above. Listen mindfully. It will connect you to your inner power. These types of mindfulness exercises will deepen your connection with nature. Most religions and spiritualities have walking practices that are used as meditation or for connecting to the divine. Zen walking, for instance, is a Buddhist practice in which we focus on the sense of movement. Christians can walk in a religious way by being mindful of how they walking through God’s creation, being mindful of the land and they move through it. Wherever you walk, walk mindfully. It’s important to make room for some brain training habits too. Here are some of the best habits for training the brain. Books are beautiful. When you read a book you experience many of the same states as you do when you meditate. Your mind slows down. You relax. The noise dissipate. Our heart rate lowers. It can be easy to turn your day into a blur. You start out with ideas of what you want / need to do, and you set about doing them. But the plan doesn’t quite work out so you end up doing two things at once, then three things… and you’re not really focusing on any of them. Tell yourself the one thing you’re going to do. Do that one thing. Complete it. Then move on. The sense of smell is immensely powerful. Smell is connected to memory. When we smell things we bring memories to mind. Therefore, we can use sense of smell to get in touch with ourselves. Intuition is very powerful. Science suggests that people are at their wisest when they listen to that little voice inside. Let your inner voice speak to you, and listen. Mindful breathing is the single most important mindfulness technique. This exercise is highly versatile. You can do it just about anywhere, whether you’re lying in bed or out for a walk. And it only takes sixty seconds. Simply breathe in through your nose, hold for a count of five, and then breathe out slowly. As you breathe, focus on letting your breath flow naturally and easily. At times your mind will lose its anchor and you’ll find yourself flooded with thoughts. Simply observe those thoughts. Let them be. Let them go. Watch your breath with your senses. Observe as your breath becomes one with the wider universe. If you thought you would never be able to meditate, guess what? You’re now meditating, and it only took one minute. Simply spending 20 minutes mindfully observing nature will make you happier and healthier. This is a very easy mindfulness exercise, but it’s also highly potent. It’s one of my personal favourites, too. It connects you to the beauty of nature. To do this exercise, start by picking an object of natural beauty; a waterfall, for instance, or a flower. Once you’ve chosen a subject to meditate on, begin to observe the object through your senses. You can do this in just a couple of minutes, that’s all. I personally love rainbows. Whenever there’s a rainbow out I’ll spend five minutes just mindfully observing it. This exercise is a way of creating “anchor points”. With this exercise you’ll naturally train your brain to become mindful at specific moments. When you open the curtains (for example) allow yourself to be completely mindful. Take that moment, those few seconds, to be completely mindful—the same with turning the door handle or having a shower. Make those your mindful moments. Every day you perform these simple tasks, allow yourself to be mindful. Through a process of repetition you will train your brain to naturally be mindful at those moments. The process will soon become automatic. Then, you’ll have mindful moments without even having to try. I love this exercise because it allows you to take mundane every day activities—like turning a door handle—and turn them into your own little moments of mindfulness. Practicing mindful listening will make you more aware and more focused on the present moment. It’s another great mindfulness exercise. Everyone loves a good listener, right? But even better than a good listener is a mindful listener. Mindful listening is all about listening to people in a non-judgmental fashion. Not only is this excellent for the person you’re listening to, but it’s fantastic for you too. Most of us are highly influenced by the things we hear. It can be quite easy to become irritated when someone says something thoughtless, for instance. But when you practice mindful listening you stop being affected by words. When you’re listening to someone speaking, just focus on the sound. Don’t judge, just listen. You can also do this activity with music. If you play an instrument you likely do this already. I’ve played piano for thirty years. When I play I sink into the music. I let it take me. I flow with the sound of the piano. And if you’re not a musician, hey, no sweat, just put a piece of relaxing music on and listen to it mindfully. You’ll find this supremely tranquil. The Wax On Wax Off scene from The Karate kid is all about mindfulness. Mr Miyagi is giving Daniel a mindfulness exercise. A lot of us literally don’t have any time at all. I know there are often days when I’d do anything for five minutes just to chill in. How do you practice mindfulness on days like those? The trick is to take an activity that you’d do anyway. For instance, you have to do the dishes. Why not do the dishes mindfully? Or how about eating. You have to have dinner, why not eat mindfully? Three awesome things happen when you do chores mindfully: 1) You get a good spot of mindfulness, 2) You complete the task you have to do anyway, and 3) You do that task quicker and better than normal because you’re focusing on it. So, do the thing you need to do, just do it mindfully. You remember the scene from The Karate Kid when Mr Miyagi is teaching Daniel to clean his car, and he says “Wax on, wax off”. He’s teaching Daniel to clean his car in a mindful way. The trick is to be one with the movements, one with the “wax on” and one with the “wax off”. Be mindful. By doing tasks mindfully you’ll get the task done better and quicker, and you’ll get some free mindfulness. It’s a win / win situation. And the true is that you can do anything in a mindful way. You can even lie down in bed mindfully. So the idea of not having another time is bull poop. Try mindfully describing the beauty you see. This beautiful sky, for instance. What do you see when you mindfully observe a beautiful sky like this? Talking to yourself is usually considered a sign of insanity. This exercise flips that notion on its head. The trick here is to observe the things you’re experiencing through your senses. If you’re out for a walk, describe the sky—the colours, the shapes, the feelings it creates in you—describe the scenery, describe the motion of walking, and so on. This simple exercise trains your mind to be aware of your senses. It improves the communication between your conscious mind and your unconscious mind. And all you need do is describe a few things around you. My favorite way of doing this is by using these mindful writing exercises. Grab a cat / dog / bunny / octopus (hey, whatever works) and snuggle it. Close your eyes. Feel that sense of love and warmth. Be mindful of that. This will put some love in your soul. By performing mindful habits we train the mind to be mindful always. These little gems make meditation a habit. And the result is increased relaxation, happiness, and productivity. What’s your personal favorite mindful habit?